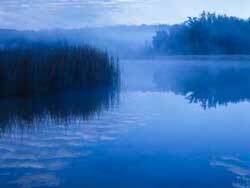 The freshwater wetlands of the Greater Blue Mountains include the upland swamps on waterlogged soils in the higher rainfall parts of the sandstone plateaux, and occasional reedlands in more permanent standing water at lower altitudes. Freshwater wetlands are diverse, usually treeless habitats that occur in areas that are either permanently or temporarily inundated by water, or permanently or temporarily waterlogged. 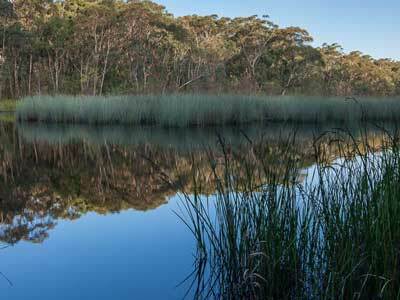 They occupy less than 0.5% of the Greater Blue Mountains World Heritage Area and include sedge and shrub-swamps on poorly drained, sandy peat soils of the plateaux, and the reedlands and aquatic herbfields along the major waterways. Intricate mosaics of different plant communities often occur within these wetlands in response to slight differences in water levels and soil moisture, and in response to varying fire regimes. Coastal Heath Swamps are generally restricted to altitudes below 600 m in the Sydney region; however, in the Blue Mountains higher altitude examples of this swamp type are found in the headwaters of creeks on the sandstone plateaux (with most occurring above 500 m in altitude) in areas of relatively high rainfall (~1000 mm or more per year). They are visually prominent, often lush, patches of bright green vegetation scattered amongst the surrounding dry sclerophyll forests. Their often spongy, sandy-peat, low-nutrient soils support dense swards of grass-like plants such as Button Grass (Gymnoschoenus sphaerocephalus) and sword-sedge (various species of Lepidosperma), herbs such as Sundew (Drosera) and Coral Fern (Gleichenia), and a variable layer of small and large sclerophyllous shrubs such as Callistemon citrinus, Coral Heath (Epacris microphylla), Heath-leaved Banksia (Banksia ericifolia), Dagger Hakea (Hakea teretifolia) and various tea trees (Leptospermum species). Many of these swamps occur on steeper valley sides in association with groundwater seepage and are known as hanging swamps. Examples of this vegetation can be seen along Bells Line of Road, on the Kings Tableland and in the Mount Hay area. 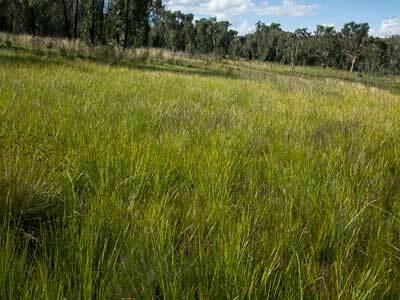 These swamps frequently occur around the edges of townships scattered along the Great Western Highway in the upper Blue Mountains. 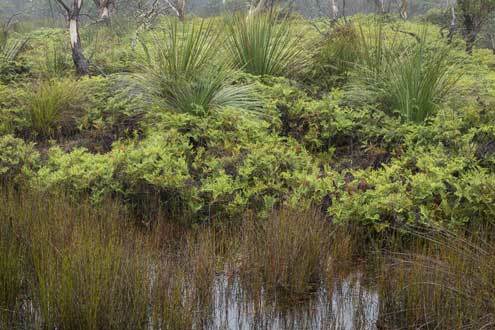 The prominent swamps on the Newnes Plateau (many of which are outside the World Heritage Area) are often considered to be an intermediate form between this coastal class and the Montane Bogs and Fens. Similar poorly drained locations at the highest altitudes in the Greater Blue Mountains, up to about 1300 m above sea level, support Montane Bogs and Fens. The cool climate, low evaporation rates and impeded run-off in these habitats allow the development of deep, low-nutrient, peaty soils, some of which contain Sphagnum moss. They also feature dense swards of sedges and grasses, with various low growing herbs, and there may be scattered, or occasionally dense, groves of emergent sclerophyllous shrubs such as Grey Tea Tree (Leptospermum myrtifolium), Alpine Bottlebrush (Callistemon piyoides), Mountain Baeckea (Baeckea utilis) and Boronia deanei. Occasionally, snow gums and other trees may occur within these bogs. The most extensive examples can be seen on the Boyd Plateau in Kanangra Boyd National Park and around Mt Werong to the south. Coastal Freshwater Lagoons are complexes of aquatic plants that occur in or adjacent to standing water in floodplain lagoons and lakes. They generally have higher nutrient conditions than the upland wetlands described above, and contain dynamic mosaics of sedges and aquatic and floating herbs that vary with the rise and fall of the water level; these include Eleocharis sphacelata, Twig-rushes (Baumea species), Duckweed (Lemna disperma) and Frogmouth (Phylidrum lanuginosum). In some situations, low forests of paperbarks (which fall within the Forested Wetlands formation) occur in conjunction with these wetlands. 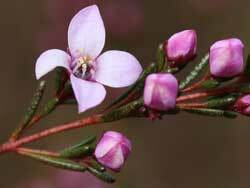 They are uncommon in the Greater Blue Mountains and are largely restricted to the lakes at Thirlmere. Small, unmapped occurrences are also likely to occur along major waterways on the eastern side of the ranges, such as in Glenbrook Creek and the lower reaches of the Macdonald River. Both the Coastal Heath Swamps and the Montane Bogs and Fens of the Greater Blue Mountains include three threatened ecological communities. These are the Blue Mountains Swamps (vulnerable), the Montane Peatlands and Swamps (endangered) and the Newnes Plateau Shrub Swamp (endangered). 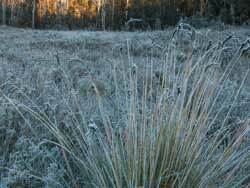 The wetlands at Thirlmere may fall within the threatened communities Sydney Freshwater Wetlands (endangered) and/or Freshwater Wetlands on Coastal Floodplains (endangered). 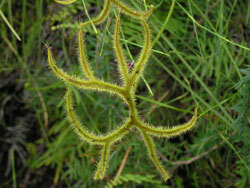 This threatened species is classed as "vulnerable" and is restricted to the Blue Mountains & Kanangra-Boyd area. A member of the Droseraceae family that includes the Venus Fly Trap, its "branches" have glandular hairs that trap insects. Here's an mage of its flowers. 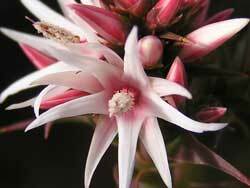 Flowering in winter and spring, the second layer of five petals are sepals. 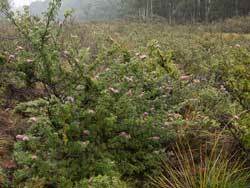 This restricted variety of Montane Bogs and Fens is an Endangered Ecological Community. It features yellowish clumps of Button Grass (Gymnoschoenus sphaerocephalus), Pouched Coral Fern (Gleichenia dicarpa) and flowering shrubs of Grevillea acanthifolia subsp. acanthifolia (endemic to the higher Blue Mountains). A string of Coastal Freshwater Lagoons was created here when earth movements tilted the valley of a small creek. 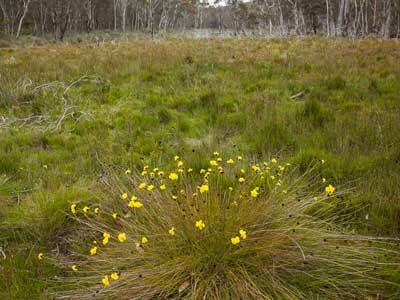 Many of the Endangered Ecological Community Montane Bogs and Fens on Newnes Plateau are threatened by the groundwater impacts of underground coal mining.